Geoff and Jessica Cooper attended the Flying Legends 2012 air-show at Duxford Airfield recently. They each bring us bring us their own views on the show, accompanied by great photographs from Geoff. Chris Head (BMus (Hons), BAv(ATP), Dip Tchg), who is currently a B-category flight instructor at Massey University’s School of Aviation, presents the case for a network of common frequency zones in class G airspace throughout New Zealand. The final part of a five-part series of articles; Christine Ody concludes her series of articles on what it takes to become an Air New Zealand pilot. 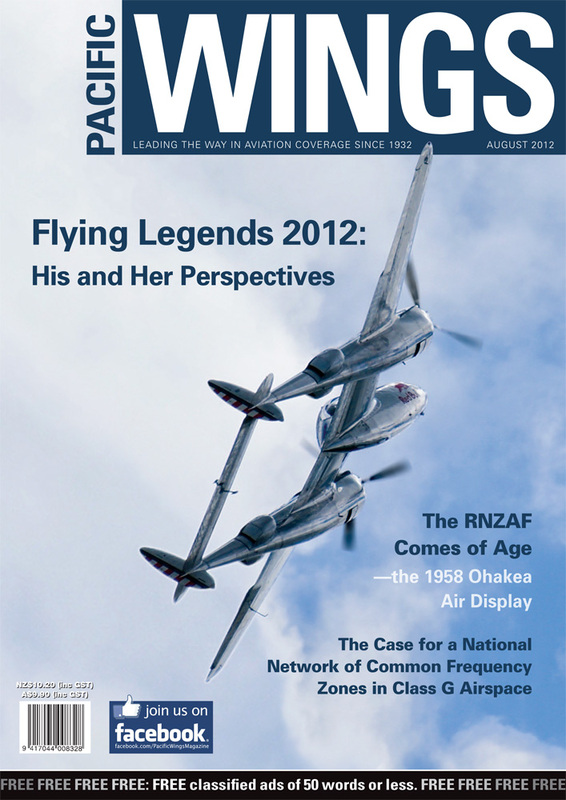 Paul Sortehaug continues his series of articles on New Zealand’s air aces with the story of Wing Commander Ronald Edward Bary. A light-hearted look at the serious subject of radio communication in flight. Sandy Doone highlights the difficulties of finishing a cup of coffee while transiting politically sensitive airspace. Don Nairn grew up on his parents farm the Takapu Valley, north of Wellington. He matriculated from Wellington Boys’ College and became an engineering apprentice with the intention of getting into the aviation industry.